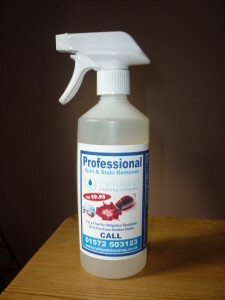 This is our professional carpet cleaning spot and stain remover that we give away free with all carpet cleans. To get yours simply book a carpet or upholstery clean with us . 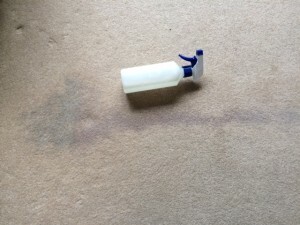 I’ve written many times before about the danagers of using ‘something from under the sink’ to deal with any accidents you may have with your carpets. I know that the adverts on tv make it look like they can work miracles but in reality whilst they can work and remove some stains they have their limitations in that they all contain bleaching agents. 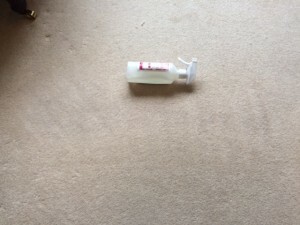 These have the effect of making the stain apparently disappear and the area of the stain look brighter BUT any stain they do not remove can be set into the carpet fibres and then become virtually impossible to remove. I spend more time dealing with the effects of peoples attempts to remove a stain rather than I would have done with the original stain. The advantage of our professional spot cleaner is that whilst it will remove or improve most stains, those that it cannot remove will not be set into the carpets which means that The Rutland Cleaning Company can still remove the stain using our array of stain removal solutions and techniques. This shows a red wine stain from a whole glass of red wine knocked over on a customers carpet in Oakham . Fortunately we had recently cleaned some upholstery for her given her a bottle of our spotter which she used to good use and got rid of most of the stain. At this point she called us. As the spotter hadn’t set the stain we were able to use some of our other solutions and then extract the carpet to get rid of the stain altogether.